The modern translation by BING is Swedish ski jump or Swedish hill, depending on whether or not I insert a space, but this seems very unlikely in that time period. The structure is clearly man-made, and about the size of a small football stadium, but seems to be much simpler in structure. There is a German Wikipedia entry for it, but I found no entry for this specific 'Schwedenschanze'. It is a military sconce (fortification) (German: Schanze) or Hill fort, the name is based on the Thirty Years' War. Sweden (German: Schweden) was a participant during the war. It is not necessary, that the Schwedenschanze you found is a real Swedish sconce. It may be a any sconce and the name is only vernacular. I try to identify your specific Schwedenschanze. Still preserved: remains of wall and fosse. 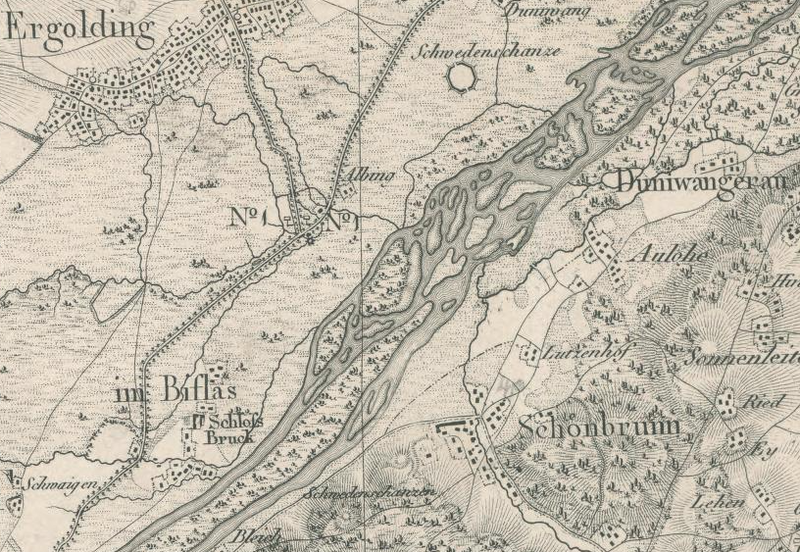 But looking at the map, I have the impression your 'Schwedenschanze' is located at the Stausee Altheim (artificial lake). 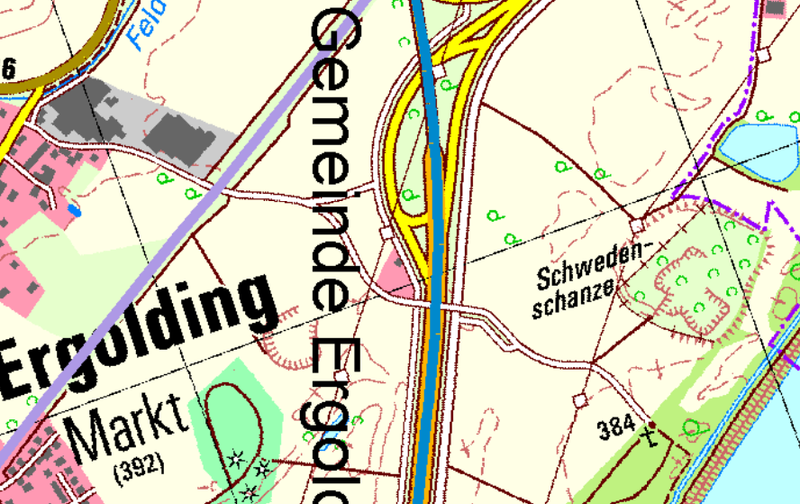 There is another website, saying the 'Schwedenschanze' in Ergolding is disappeared. Ergolding. Swedish camp during the 30-year war. 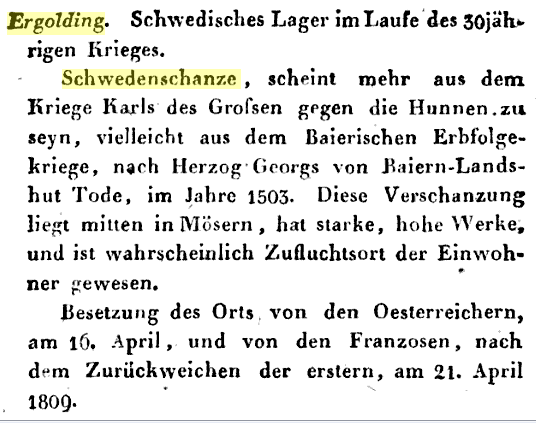 Schwedenschanze, seems to be more from Charlemagne's war against the Huns, perhaps from the War of the Bavarian Succession, after the death of Duke Georg of Baiern-Landshut, in 1503. This entrenchment is located in the middle of "Mösern," has strong, high works, and has probably been refuge for the inhabitants. The village was occupied by the Austrians on 16 April and by the French, after the retreat of the former, on 21 April 1809. This is not what the name seems to imply. The name is indeed based on Sweden and sconce, but the structure is definitively not from that time and was built originally under much different circumstances, much earlier. The representation on the old map is very probably an imaginative exaggeration, more based on the folk-etymological name than physical realities. 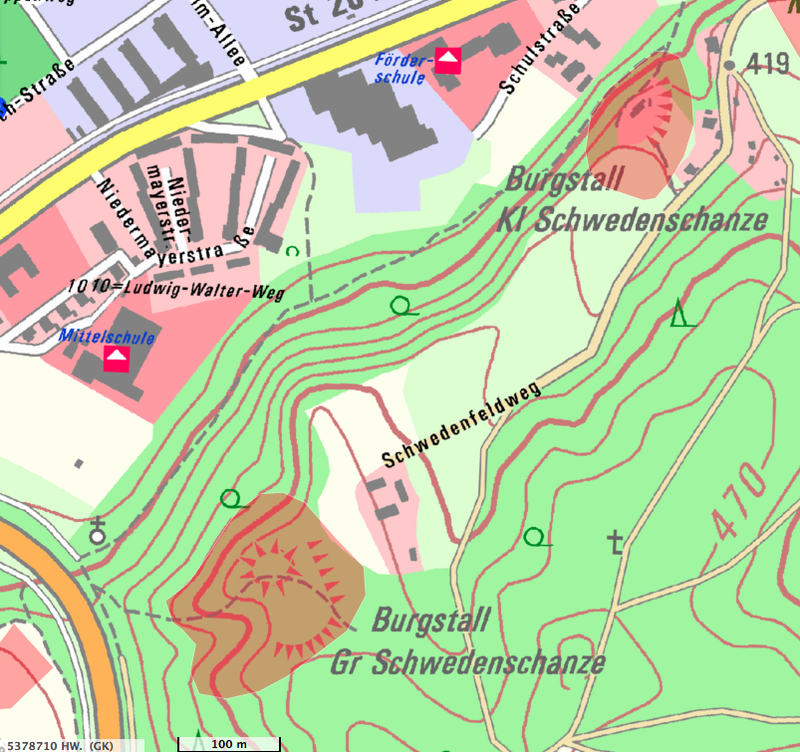 Schwedenschanze: There are numerous prehistorical and early historical ringworks and fortification ramparts in Central Europe that have erroneously, usually colloquially, been given the name Schwedenschanze, which means "Swedish schanze", a schanze being a hastily erected, military fieldwork. 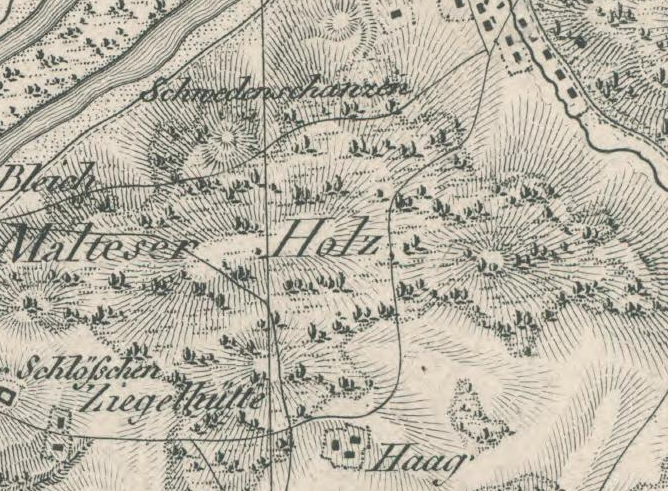 This name arose in connexion with the fighting during the Thirty Years' War, when the population of the Holy Roman Empire often used old field fortifications as refuge castles or hidden livestock pens. Particularly in Catholic areas this action was taken to protect people from the Protestant forces of the Swedish king, Gustavus II Adolphus. Whether the individual fortifications were actually used as fighting positions, however, is usually speculative. Many of the often well preserved earthworks in the forests of Europe were probably later associated wrongly with this religious war. The history of these heritage sites often goes back several thousand years. They were frequently extended during the Early Middle Ages, for example, to defend East Francia and other regions in the 10th century from the Hungarian invasions. It is true that in the 17th century, during the Thirty Years' War, numerous earthworks and schanzen were thrown up during the conflict. 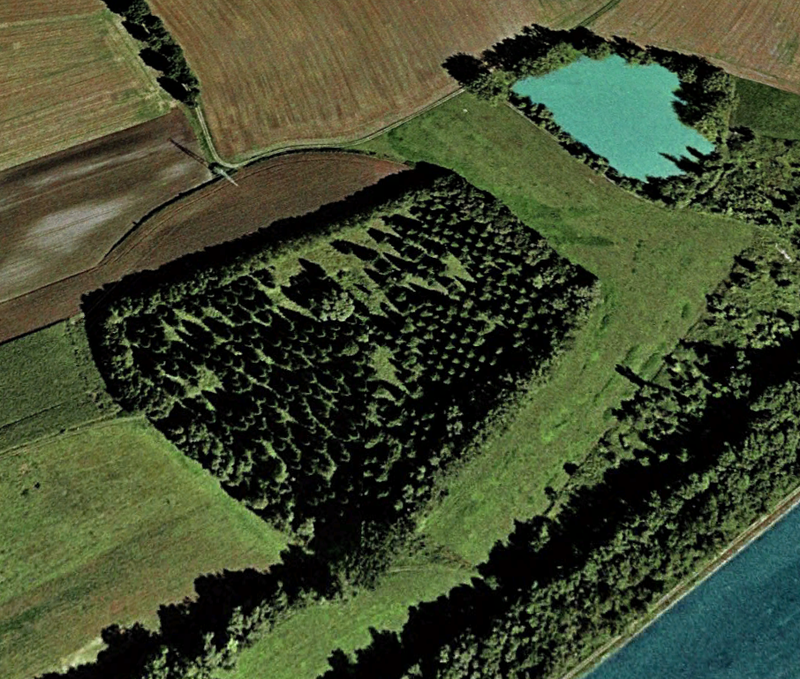 But these are clearly distinguishable from the older sites by their regular, geometric shapes. Occasionally there were also fortifications that were actually built by the Imperial Army, i.e. Catholic League troops that were later called Schwedenschanzen; such as the Schwedenschanze in the Rhön. The Burgstall Große Schwedenschanze is a high medieval hilltop castle in the Landshut district of Schönbrunn. The former castle complex is registered as a ground monument with the number D-2-7439-0045 by the Bavarian State Office for Monument Conservation. For that the proper name would be Wallburg, or hillfort in English. 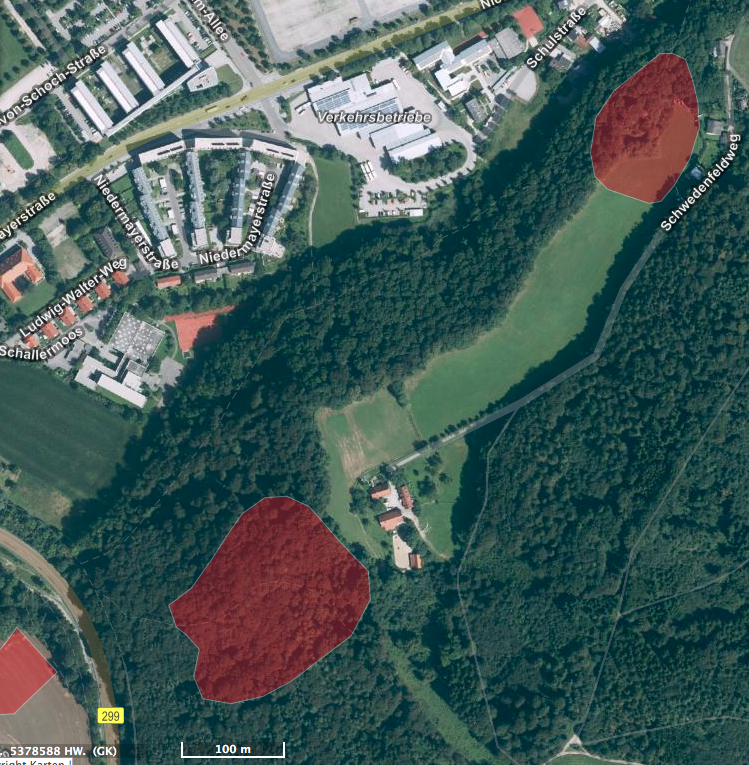 Which would make these structures early medieval or medieval fortifications for relatively peaceful times, guarding the traffic routes on the rivers and old Roman roads. According to Johann Auer: "Altwege zwischen Abens, Donau und Isar", Dünzling, 1999. 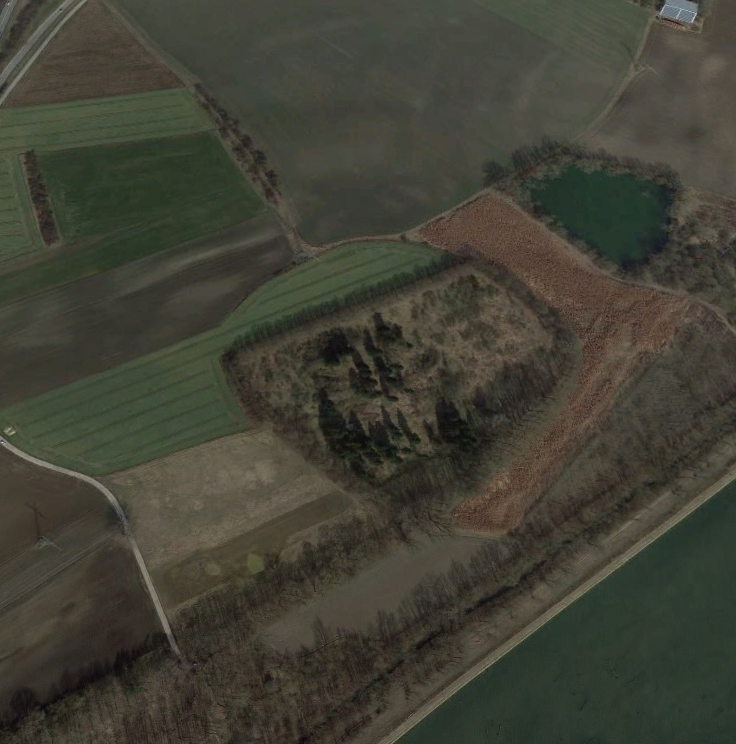 (PDF) the whole area is scattered with similar structures, often but not always called Schwedenschanzen. Whatever the original purpose for these structures was, researchers in the 19th century already wonderd about the name for it but they did connect some archaeological finds there with the Thirty Years' War for this particular one (Google books page from Verhandlungen des Historischen Vereins für Niederbayern, Volumes 5-6, Der Verein, 1856 - Niederbayern (Germany)), indicating that some fighting did take place there. Beschreibung Vor- oder frühgeschichtlicher Ringwall, Siedlung des Neolithikums u.a. wohl der Münchshöfener Gruppe, der römischen Kaiserzeit und des Mittelalters. __Prehistoric or early historical ring wall, settlement of the Neolithic, among others, probably the Münchshöfen group, the Roman Empire and the Middle Ages. The Münchshöfen group is dated from 4500–3900/3800 BCE. 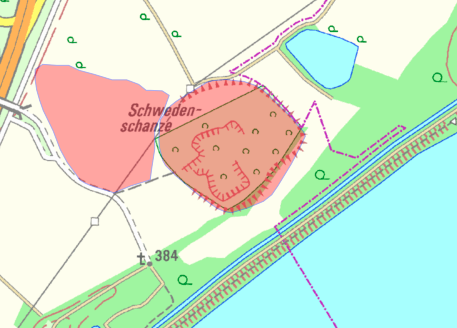 The other 'kleine' Schwedenschanze in close vicinity (see above map Schwedenschanzen) is D-2-7439-0044, located at the street "Schwedenfeldweg" and that is the one that is visually disappeared now, dated also to the Neolithic. Closeby on the same road, slightly to the South-West, is the 'Große' Schwedenschanze D-2-7439-0045, equally pre-historic. Not the answer you're looking for? Browse other questions tagged germany maps or ask your own question.